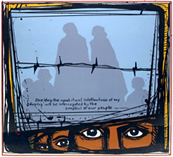 Presented in collaboration with the Purdue Latino Cultural Center, “Humanigration” presents artworks from the collection of Gilberto Cárdenas, assistant provost and director of the Institute for Latino Studies at the University of Notre Dame. 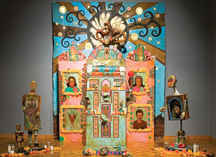 An avid collector of Chicano, Mexicano, and Latino art in general, Cárdenas has contributed to the creative expressions of the Latino community by promoting, exhibiting, and publishing Latino artists and supporting cultural centers in the United States. The works in this exhibit will focus on the theme of immigration, to coordinate with a presentation on the “Humanigration” project sponsored by the LCC. Selections were made by Maricela Alvarado, director of the Latino Cultural Center, Ivan Hernandez, director of Admissions at Ivy Tech, and Purdue Galleries director Craig Martin. Visit the Purdue Latino Cultural Center website.